The empty pedestal that once held the "Early Days" part of the Pioneer Monument, taken down in September 2018. 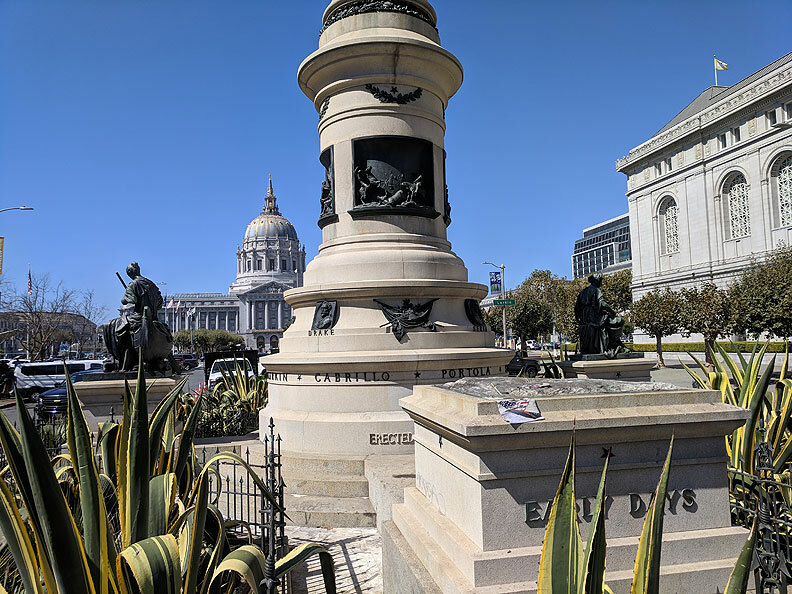 The SF Arts Commission has recommended that this monument, which depicts the subjugation of Native peoples by white settlers, be moved from its current location, to be placed either in storage or some other, less prominent location. The disputed statue, removed in September 2018. The Board has rejected this advice, primarily on free speech grounds. I have worked as a professional artist for 25 years, and I am also a free speech advocate, having worked for the past 11 years for the Electronic Frontier Foundation, where we work to defend and promote free speech in the digital world. As an artist and free speech advocate, I would like to inform the Board that they have badly misunderstood the concept of free speech in taking this stand. As a city, we should not be engaging in any speech that actively denigrates, demeans, or insults an entire community or cultural group. We should not say racist things! If we are unsure, or if there is disagreement about whether certain speech is in fact racist, we should listen to the communities affected. 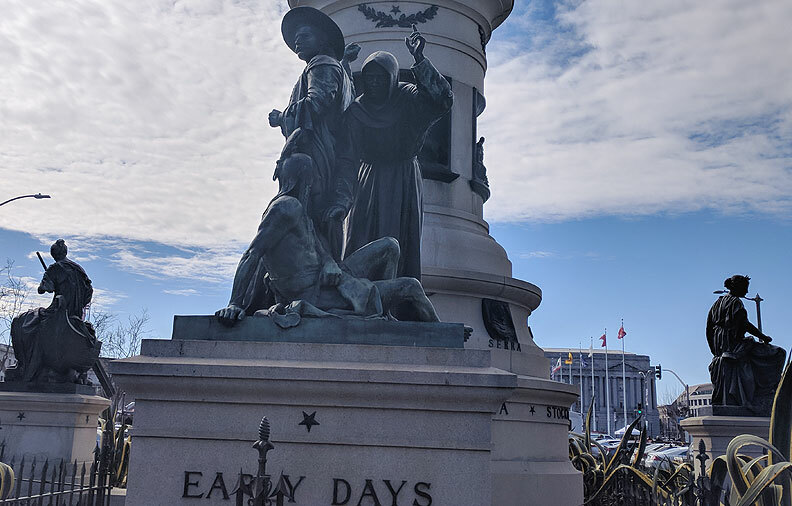 In this case, Native peoples have been telling us for many, many years that this statue is racist, it is hurtful, it is unwelcome. Its depiction of history is false. We must listen to them. Finally, I would like to say that this does affect me personally. I am not a Native person, but I have several beloved members of my family who are Native American, from the Tlingit tribe in Alaska. When I welcome them to this city, I do not want them to face that statue. I want them to know that they are welcome and respected here. As an artist, I know that art and symbolism matter. Art and speech matter. What we say with our free speech matters. We, as a city, should not say racist things. Please vote to remove this symbol of hate from our civic center. Thank you. 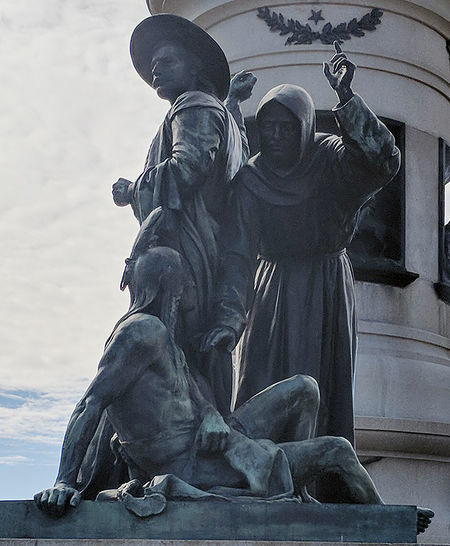 Close-up of the disputed monument. 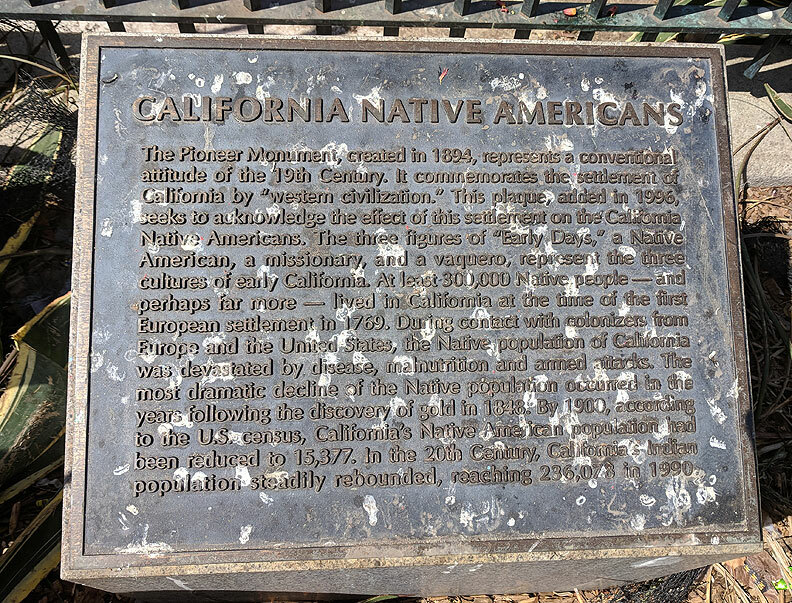 This plaque was placed in 1996 during an earlier epoch of protest against the "Early Days" depiction of racist denigration. Finally it was far too cautious in its presentation of history, in light of recent scholarship into the genocide carried out against California Indians from 1846-1873.